Wendin Cottage Self-cateringPretty, attractive and comfortable are the words that spring to mind in describing Wendin Cottage. 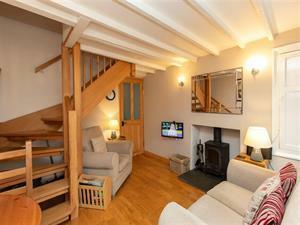 Dating from the 18th century this cosy terraced property was formerly a 'tied' cottage in the grounds of Busk House. It now offers charming holiday accommodation for two looking for a cosy nest just a short stroll from the centre of Ambleside. Pretty, attractive and comfortable are the words that spring to mind in describing Wendin Cottage. Lowwood Leisure club situated between Troutbeck & Ambleside. Children welcome from any age. Wendin Cottage offers weekly bookings starting on Saturday.